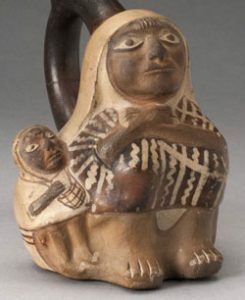 The collapse of the Chavin state in Peru, about 250 BC, seems to have opened the way for the Moche and the Nazca to develop states of their own. 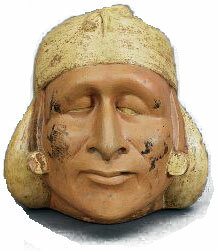 The Moche started up around 100 AD along the Pacific coast of South America, in what is now northern Peru. The Moche kingdom was mainly based on farming the same foods that the earlier Chavin people ate: potatoes, chili peppers, corn, beans, yuca, avocado, coca, quinoa, squash, sweet potatoes, peanuts. To help with the farming, the Moche built big complicated irrigation systems all over the area they controlled. Like earlier Peruvian people, the Moche did a lot of fishing from boats made of bundles of reeds. Nobody knows exactly what the government of the Moche looked like – it may have been an empire, or it may have been a bunch of independent city-states united by having the same language and culture, like classical Greece just a little earlier. Moche women seem to have held some power, judging from their appearance in mural paintings and their rich tombs. The Moche built a mudbrick pyramid called the Huaca del Sol (the Temple of the Sun), and another pyramid nearby called the Huaca de la Luna (the Temple of the Moon). These had stone carvings and painted murals. There are many other Moche towns as well. The Moche continued to control much of modern Peru until about 600-800 AD, when their empire seems to have collapsed. This collapse may have been caused by climate change about this time. In its place, the Inca empire formed. Cite this page: Carr, K.E. Who were the Moche? South American history. Quatr.us Study Guides, September 9, 2017. Web. April 25, 2019.